Washington, USA -- Scientists and ethicists alike welcomed the news on Tuesday that two groups had been able to reprogram ordinary skin cells to act like embryonic stem cells - the body's ultimate master cell. The new cells bypass the moral and ethical questions of using a woman's egg cell to make a human embryo - which is then dissected to derive its stem cells. Stem cells -- which scientists hope to use to treat diseases including diabetes, Parkinson's disease and spinal injuries - will be easier to make as well, as human eggs are very hard to come by and the cloning technology needed to make a human embryo has so far proven near impossible. Politically, the cells would be eligible for U.S. federal funding without the need for any new legislation. "It's a win for science and for ethics," said Richard Doerflinger, deputy director of pro-life activities at the United States Conference of Catholic Bishops. "We have a technique that doesn't use women's eggs and doesn't use embryos to make very versatile pluripotent stem cells that are matched to any patient," Doerflinger said in a telephone interview. "I think this is a wonderful advance for basic research in stem cells and maybe some day for regenerative medicine." Two teams -- one led by James Thomson of the University of Wisconsin and the other led by Shinya Yamanaka of Kyoto University in Japan and the University of California San Francisco - reported separate methods, each using four genes, to reprogram skin cells into induced pluripotent stem cells - iPS cells for short. Pluripotent cells, such as embryonic stem cells and the new cells, can live almost forever in a lab dish and can morph into any type of cell in the body, but cannot create a baby. Both teams said the cells are not ready for immediate use in people because potentially dangerous viruses were used to deliver the genes that transformed the cells. But they said they could be used very soon to screen new drugs and to study diseases. "It is relatively easy to grow an entire plant from a small cutting, something that seems inconceivable in humans," said Azim Surani of Britain's University of Cambridge. "Yet this study brings us tantalizingly close to using skin cells to grow many different types of human tissues." Alta Charo, a professor of law and bioethics at the University of Wisconsin, said the finding should please both left-wing and right-wing critics of embryonic stem cell research, whose worries ranged from the effects on what many consider to be an innocent human being, to the potential for exploiting women for their eggs. "This is a method for creating a stem cell line without ever having to work through, at any stage, an entity that is a viable embryo," Charo said in a statement. "Therefore, you manage to avoid many of those debates with the right-to-life community." But Charo worried that the discovery would strengthen the resolve of U.S. President George W. Bush, who has repeatedly vetoed legislation in Congress that would widen federal funding of work on human embryonic stem cells using embryos left over at fertility clinics. Thomson, who first made human embryonic stem cells in 1998, said scientists need to continue to work with them. 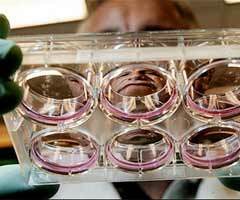 Scientists may yet find that embryonic stem cells are more powerful, he said. "The political controversy has set the field back four to five years," Thomson told reporters in a telephone briefing.